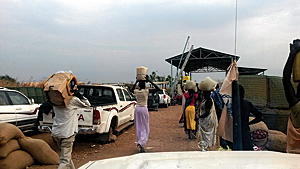 By the end of December 2013, civil unrest was reported in most regions of South Sudan, and thousands had fled their homes to seek shelter in UN-based compounds. Photo courtesy of Patrick Noonan, WFP, South Sudan. South Sudan, a landlocked country in northeast Africa, is the youngest nation in the world. In 1982, after a decade-long pause in the country's civil war between the north and south, conflict reignited. Following the death of more than 1.5 million people, a peace agreement between the two sides was signed on July 9, 2011, creating the Republic of South Sudan. With an estimated population of 10.3 million, 90 percent of South Sudanese households depend on crop farming, animal husbandry, fishing, or forestry for their livelihoods, but productivity across all these sectors remains minimal. Peace didn't last long in South Sudan. On the evening of December 15, 2013, fighting erupted between the two main ethnic groups spreading beyond the capital city of Juba to Bor and Akobo in Jonglei State, where two Indian United Nations Mission in South Sudan (UNMISS) peacekeepers were killed when a UN house was stormed. By the end of December 2013, civil unrest was reported in almost all regions, and as a result, tens of thousands of people fled from their homes to seek shelter in UN-based compounds. By December 22, 2013, the UN confirmed hundreds of people had been killed in the conflict and approximately 62,000 people have been forced to flee their homes in 5 of South Sudan's 10 states. Of those, 42,000 sought refuge at UN bases. The United Nations Office for the Coordination of Humanitarian Affairs (UNOCHA) reports indicated that the looting of humanitarian compounds and theft of vehicles impacted UN agencies nationwide.